Biomass Energy Systems, Inc. Demonstration Has Major Alternative Energy Use Implications for US Military, Islands, and State of Hawaii. (University Park, IL– November 2015) A waste-to-energy (WTE) project that will demonstrate the efficacy of converting 10 tons of waste per day to electricity using a state-of-the art gasification technology has begun at Joint Base Pearl Harbor-Hickam, Hawaii (JBPHH), inside the campus of the Hawaii Air National Guard (HIANG). The demonstration is sponsored by Hawaii Center for Advanced Transportation Technologies (HCATT) of the State of Hawaii, an initiative of High Technology Development Corporation (HTDC), under a contract with Biomass Energy Systems, Inc. (BESI). BESI, a leading IL-based engineering firm specializing in alternative energy integration, has designed and manufactured the WTE solution, which it will also install and operate for the demonstration. The WTE solution uses BESI’s proprietary TurnW2E® Gasification System. Funded by the US Air Force (USAF) under its Air Force Research Laboratory (AFRL), the demonstration is comprised of seven different tests, scheduled to run over a period of several months. The shakedown phase begins in January 2016 at the HIANG campus. The seven tests of the demonstration will involve processing representative waste materials designated as priorities by HCATT and the USAF, much of which would normally be deposited at landfills. The goal of the demonstration is to validate that these wastes could be converted into electricity to provide an independent source of power to the renewable-energy microgrid planned for implementation at the HIANG campus, inside JBPHH. The conversion of the waste material used is diverted from final disposal at a landfill, preventing the release of greenhouse gases into the atmosphere from the decomposition of the waste. The BESI solution has the capacity to process 10 tons of waste per day, while generating enough energy to power the system itself, and also yield 300 kilowatts of net output, thanks to the high performance and efficiency of the gasification core and components of the integrated system. The system is comprised of 23 modules, which will be assembled in a relatively compact configuration, occupying a 7,000 square foot area on the Hawaii Air National Guard campus. BESI was selected for the demonstration because its proprietary TurnW2E® technology fulfilled all USAF/HCATT criteria for a small-scale WTE utility. The BESI solution has the ability to process varying volumes and densities of mixed waste, and has been demonstrated at both large and small scale. Once installed, the system is relatively simple to operate, and can easily manage varying volumes of waste input. 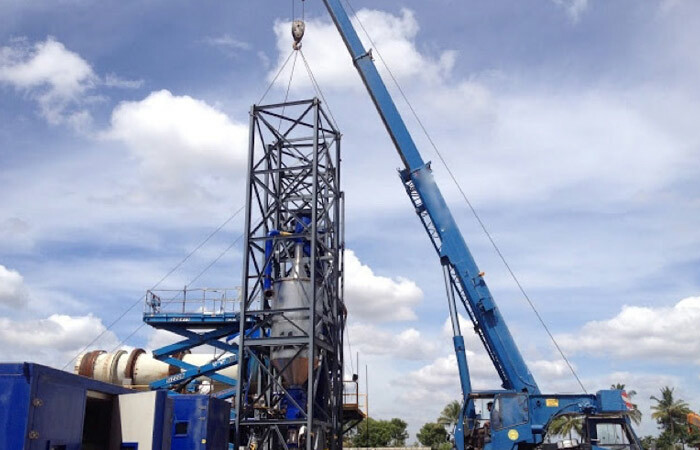 The design specifications developed by BESI include using very little water, primarily in its gas cleanup processing, to meet the USAF/HCATT requirements. In addition to diverting waste from landfills, this project is intended to demonstrate the potential reduction of imported fossil fuel currently used for utilities at the base. Hawaii, as a remote island destination, imports massive amounts of diesel as the primary source of energy production. On a broader scale, the demonstration represents an opportunity to use waste diverted from landfills instead of fossil fuel as a power source at not only the Hawaii Air National Guard campus, but also throughout the base, Oahu, and all of the other islands of Hawaii. BESI WTE solutions, and the TurnW2E® Gasification System, have been successfully implemented and utilized at numerous facilities throughout the world, as part of both government and privately sponsored projects. While the system being installed for demonstration at JBPHH has been designed to meet the R&D Requirements for the USAF, it has broader applications in civilian communities, particularly as an addition to recycling programs and to provide industrial power to manufacturing facilities worldwide. © 2019 Biomass Energy Systems, Inc.